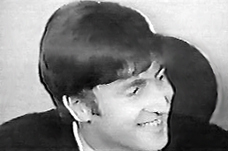 ABOUT THIS INTERVIEW: In this very brief discussion at London Airport, John Lennon and Paul McCartney look ahead to their upcoming Royal Variety Show performance-- only five days away. Recently making the news was a comment from Edward Heath, the Lord Privy Seal, stating that he had difficulty distinguishing the Beatles' Liverpudlian accents as "The Queen's English." 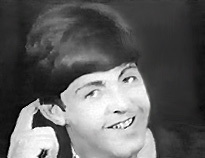 Q: "Paul, have you thought about your act for this show yet? Any changes in the act, or is it going to be, you know, the usual routine?" PAUL: "No, we'll have to change it I'm sure. We can't do the same thing all the time. We haven't thought about what we're gonna do yet." Q: "Suits with collars on? Brush part in hair? Anything like that?" PAUL: (jokingly) "You never know. We might not wear suits! You never know! No idea." Q: "John, in this Royal Variety Show when you're appearing before royalty, you're language has got to be pretty good obviously-- this thing about Teddy saying that he couldn't distinguish your... The Queen's English." JOHN: (serious look into camera) "I'm not going to vote for Ted." Q: "But you're not going to change your act for the Lord Privy Seal?" JOHN: (exaggerated lowerclass dialect) "Ah no, like, we'll keep, like, the same kinda thing, like. Won't we?"